Reading a book is just the beginning. Sharing the experience - that's the real rush! 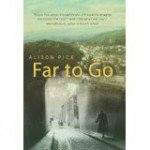 “In Far to Go, one of our most accomplished young writers takes us inside the world of an affluent Jewish family in Prague during the lead-up to Hitler’s invasion of Czechoslovakia. In 1939, Pavel and Anneliese Bauer are secular Jews whose lives are turned upside down by the arrival of Hitler. They are unable to leave the country in time to avoid deportation, but they do manage to get their six-year-old son Pepik a place on a Kindertransport. Meanwhile, a fascinating and compelling present-day strand in the story slowly reveals the unexpected fates of each of the Bauers. Through a series of surprising twists, Pick leads us to ask: What does it mean to cling to identity in the face of persecution? And what are the consequences if you attempt to change your identity? We’re glad you dropped by! We’ve read a little bit of everything over the years. Whether you’re a book club looking for some ideas about what to read or just want a good book to curl up in bed with this reading list should help! Thanks for taking time to visit!